This collection of recordings from the Lyrita catalogue is an ideal introduction to the splendid reissues that have been coming our way courtesy of Nimbus in the past few months. From the quasi baroque style of Michael Balfe's popular "Bohemian Girl", we move on to such luminaries as Elgar, Delius, Warlock and Grainger whose works are surely ingrained in our collective memory of "Englishness". 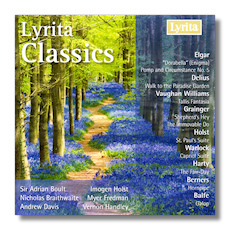 Although collectors with a serious penchant of such composers may want the complete recordings of these works, the disc is certainly a good starter to sample the delightful Lyrita sound which is certainly something to cherish. The "Fantasia on a Theme by Thomas Tallis" is particularly invigorating under Sir Adrian Boult's direction whilst Imogen Holst conducts the St. Paul Suite with typical alacrity and gritty fervor. As I've mentioned, this CD is intended as more of a sample than anything but its booklet contains a host of well written notes by such luminaries as W.A. Chislett, Imogen Holst herself and Lewis Foreman. It's available at a special low price so you could do far worse than snap up this disc for your collection before it gets deleted.